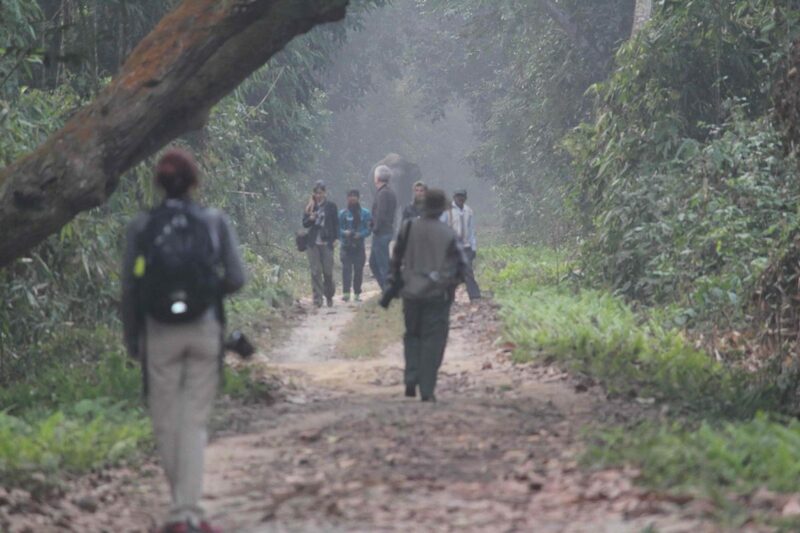 Lush evergreen forests, tall canopied trees, the call of apes in the air, and sometimes, a surprise glimpse of the gentle giant elephants during their snack break – welcome to a misty morning at Hoollongapar Gibbon Sanctuary. A first time visitor to Jorhat is awestruck by the majestic Brahmaputra whose waters weave in and out of the city outskirts, forming a mosaic of vegetation interspersed within ephemeral jheels. The largest riverine island of the world “Majuli” formed by the trans-boundary river Brahmaputra lies north of this city. Jorhat also hosts one of the 25 most endangered primate species of the world, the Western Hoolock Gibbon (Hoolock hoolock) in the Hoollongapar Gibbon Sanctuary. This winter, I got a wonderful opportunity to visit this 20 sq.km sanctuary situated 30 km away from the city. 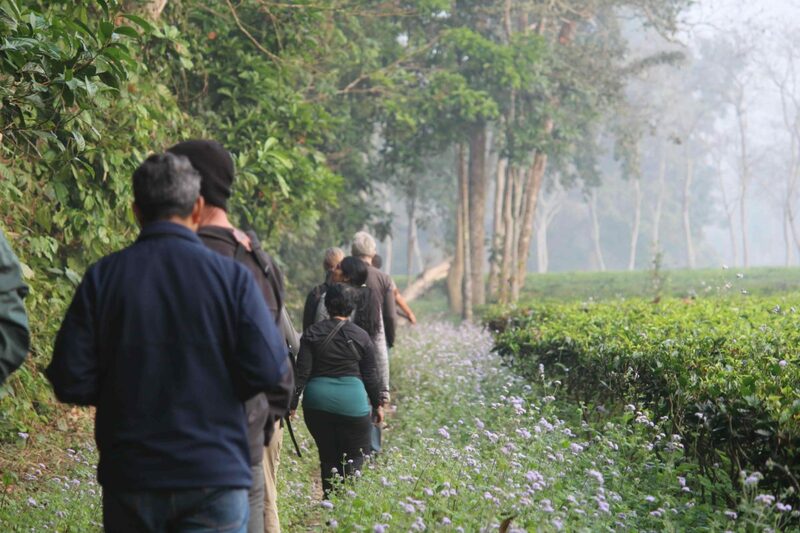 As we walked through the path between forests and tea gardens, we could hear Gibbons’ “hooroo hooroo” reverberating through the forest. In a few minutes, we saw a family with one juvenile, hanging on to its mother, who was swinging effortlessly through the canopy. 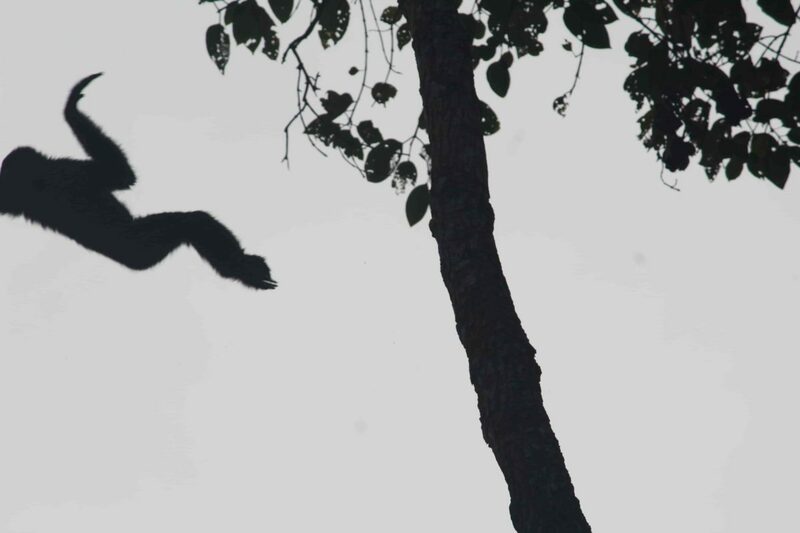 We stared astounded as these natural trapeze artists swung gracefully across trees. The guard accompanying us said that there were about 25 families and around 106 individuals in the area. Sadly, these beautiful creatures are threatened by habitat loss, fragmentation, and hunting. Their population is declining and moreover, there is no estimate on the total population size. The species has been listed in the CITES Appendix I and schedule I of the Indian Wildlife Protection Act. To improve the protection of this species, in 1997 the Assam government upgraded the status of then Reserved Forest to a Sanctuary making it the first protected area named after a primate in India. Apart from India, the Western Hoolock Gibbon is found in Bangladesh and Myanmar. In India, they are only seen in the North Eastern states. The Sanctuary is also a home to six other primate species. 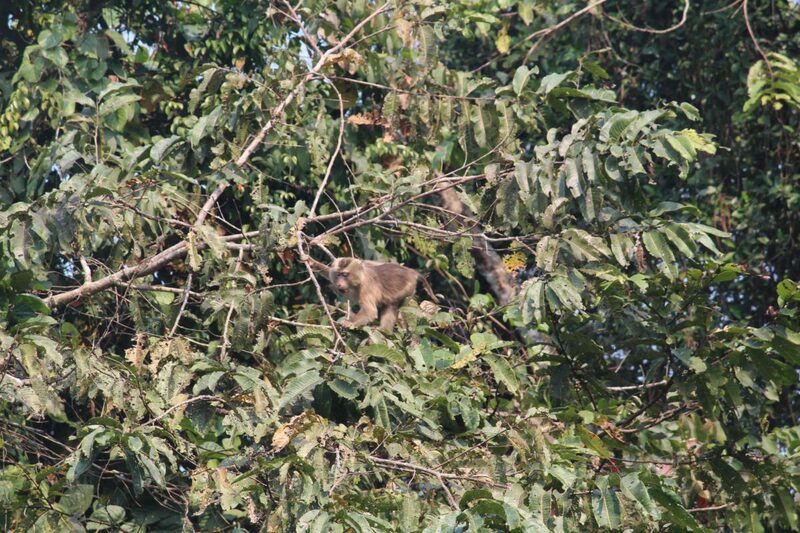 I was lucky to see two of them – Capped langur (Trachypithecus pileatus) and Northern pig-tailed macaque (Macaca leonina). The pig-tailed macaque, with its striking blue mascara-lined eyes, is a shy and elusive primate species that you can easily sight at the Gibbon Sanctuary. 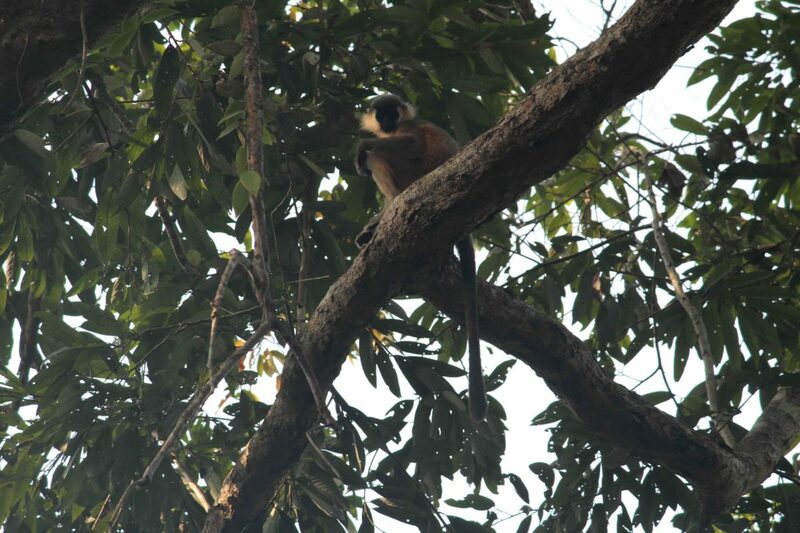 The capped langur, with its black cap and golden orange fur, is best seen in the soft glow of the sun rays penetrating through the dense canopy. Populations of both species are declining due to habitat loss and hunting, and are listed as ‘Vulnerable’ in the IUCN Red List. Although the Sanctuary is famous for gibbons and other primates, it also has a diversity of other animals. On our way to the nearby Gibbon Centre, we were surprised by an elephant at a turn. She stood calmly foraging in the middle of the path. We waited for her to pass, and then much to our collective dismay, we had to drop our idea of walking and had to proceed by vehicle for the rest of the way. An armed guard accompanied us for the rest of our journey in the Sanctuary in case we walked into the gentle beast again. This sanctuary is divided by a railway line that connects Jorhat to Guwahati, the largest city of Assam. While we were at the Sanctuary, a few trains passed at a speed of 50-60 kmph, violating the speed limit (of <20 kmph) inside a Sanctuary. 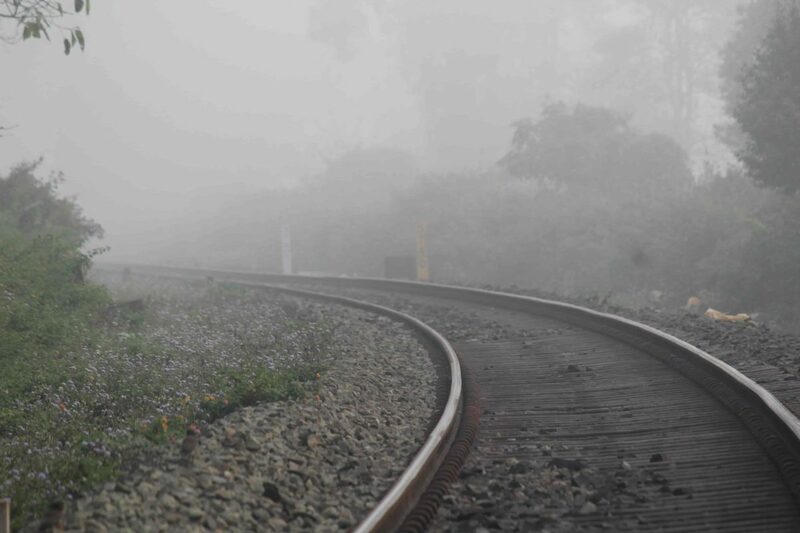 This high speed and low visibility in the night or at a turn in the track often result in train collisions that prove to be fatal to wildlife, especially elephants. 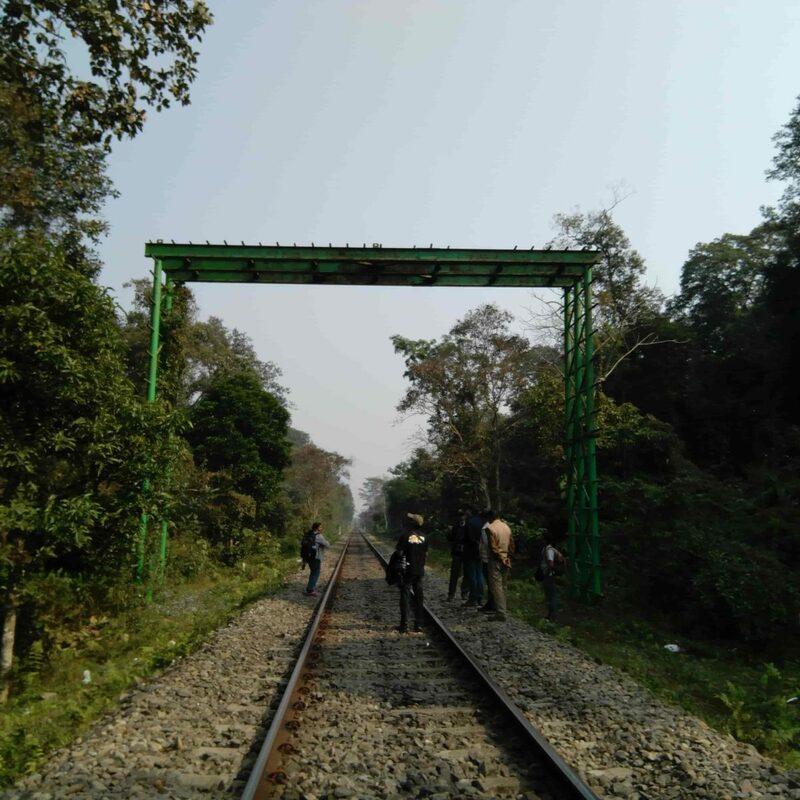 The opening up of the canopy for laying railway lines made it difficult for arboreal wildlife such as macaques, gibbons, and squirrels to move across the Sanctuary, and moreover, isolated populations. So the department constructed a metal bridge over the track for these threatened primates to move across the forest. The bridge was constructed with a motive that these arboreal creatures don’t have to descend to the ground for crossing and thus avoid collision with fast-moving trains. As tea gardens and villages mushroom in the area, these primates and other wildlife are increasingly confined to small isolated forest pockets. Additionally, a linear development like the railway line often takes a toll on wildlife by fragmenting their habitats. I left the sanctuary with mixed emotions: my amazement at this small patch of forest is a haven for so many creatures was tinged by concern about the magnitude of threats this little habitat faces from unplanned development. Dincy Mariyam is a PhD student with the Centre for Wildlife Studies and Manipal Academy of Higher Education. She works on understanding mechanisms to regulate nature-based tourism in Indian protected areas. Her interests include nature-based tourism, human-wildlife interactions, protected area management and policy-making. Article is informative. Unlike many articles, it was very balanced. Most of the articles/advertisements that I have read / watched on sanctuaries are primarily focussed from the perspective of increasing tourism without highlighting the steps government are taking ( or they should be taking ) to preserve the natural ecosystem for the creatures. When I read about the authors’ research area ( regulating nature’s tourism ), the balance in the tone of article makes sesne. Hope to read more from you. Nice work.